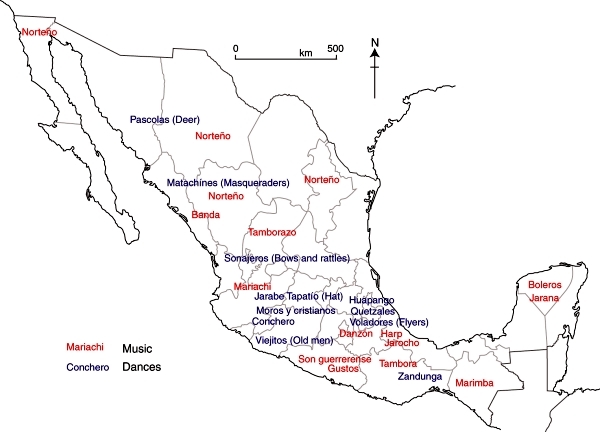 Numerous different regional music styles are found in Mexico (see map), some strongly influenced by indigenous instruments but most relying on the string and brass instruments brought by early Spanish settlers. Curiously, mariachi music, which is often considered Mexico’s national musical style, is believed to owe its origin to French immigrants and refer to wedding (mariage) music. Other popular music types include rancheras (country style songs), corridos (songs telling stories, often about heroes), norteño (northern), rock and pop. Music and dance in Mexico. Fig 13.3 of Geo-Mexico, the geography and dynamics of modern Mexico. All rights reserved. Musical instruments vary regionally as well. For instance, the marimba, a kind of wooden xylophone, is most often heard in Chiapas whereas the harp is more characteristic of Veracruz. Regional dance styles have provided the stimulus for Mexico’s numerous baile folklórico (folkloric ballet) groups, many of which tour internationally. Some examples of regional dances are shown on the map. 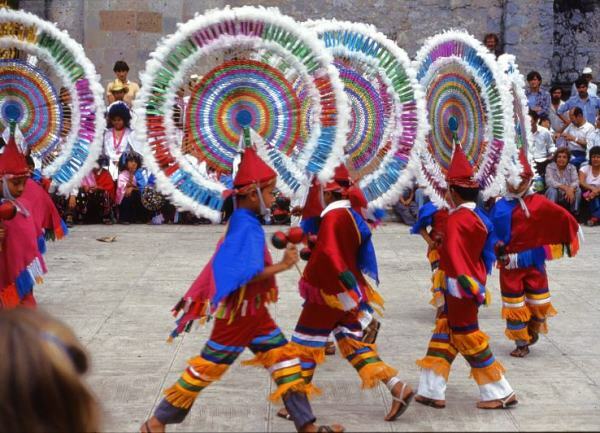 Dance of the Quetzals, Cuetzalan, Puebla. Photo: Tony Burton; all rights reserved. Some of these dances are very localized. For example, the Quetzal Dance, with its elaborate headdresses (see photo) is performed almost exclusively in the village of Cuetzalan in the state of Puebla. In addition to these cultural manifestations there are significant spatial variations among many other facets of culture, including sport, dress, architectural styles and handicrafts. Regional differences are also found in some forms of literature.